I was reading Happy Hours while I was rolling a ball back and forth with my left foot. Physical therapy. The young African American intern who was helping me, noticed the colorful cover and asked about the book. 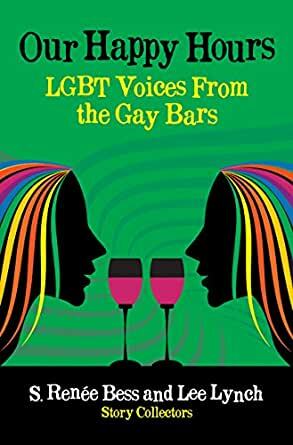 I explained that is was an anthology of LGBT stories and gave some examples. He took a picture of the cover, so he could purchase the book later. He told me he commuted by train to his job in the city and he thought having a book of short pieces was a great idea. Now, he could actually finish a piece or two without having to stop in the middle when he arrived at his destination. 5.0 out of 5 starsIt Really Did Feel like That, Mostly. This book is fabulous. My first 30 years out, I always had a “home” bar. State Bar in Flint, MI; Saints, Somewhere Else, the Marquee in Boston & Cambridge, etc. I often called them my other living room. I’d go after work, meet up with friends, play pool, Ms Pacman, Darts, the Juke boxes, dance & have the many conversations that started many of the groups that formed the basis of the so-called “larger” life us LGBT+ folk have now. This book brought it all back, the good, the great, the sad and troubling. Well worth buying, reading, writing notes in the margins of pages — and sharing with folk who were and were not “in the Life” there with us. Brava to the writers and editors. Bravissima! A wonderful collection of bar stories before the era of social media. Sentimental, nostolgic and longing. Great read. The book was well written and entertaining.